A Persian Cookbook is a unique historic cookery book. The original manuscript was drafted by Iranian, Bavarchi Baqdadi, after a spiritual journey in 1521. 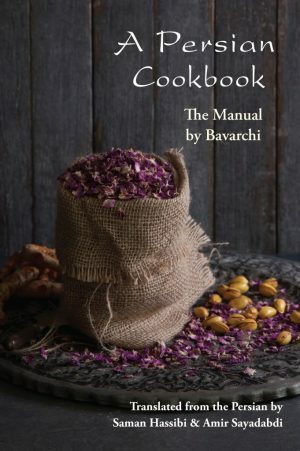 Bavarchi is the Persian synonym for cook, and, as is apparent from the text, cooking was his and his father's profession. This will be the first English translation of this earliest classical cookbook which has survived, so it will be welcomed by both culinary scholars as well as enthusiasts for Persian cookery, which has recently become extremely popular. The book gives recipes, and serving instructions, for a huge variety of filled pastries, colorful pilafs, and sour stews. Many of these sixteenth century Persian dishes are not well-known today, and the book will be a fabulous new source of authentic Persian recipes. It also provides insight into Persian haute cuisine from the early sixteenth century, vital for culinary enthusiasts worldwide. The dishes of the lower classes are also touched on but presented in a manner suitable for the Safavid court. The book paints a different picture to what has been published before, covering a myriad of food types. A few of the topics include On Breads, On Grain Stews, On Chickpea Soups, On Sour Stews, On Pilafs, On Colourful Pilafs and On Filled Pastries. The translators, Saman Hassibi and Amir Sayadabdi are food scholars and doctoral candidates at the University of Canterbury (New Zealand).